Earlier this year we discussed the importance of creating a mobile optimization strategy rather than just going responsive. Though responsive design is better than having your visitors pinch and zoom, assuming that consumers use desktop devices the same way they use mobile devices is fundamentally wrong. Consumers use their mobile devices for connectivity and quick content. In fact, 60% of local searches now originate from smartphones (Bizreport). The bottom line: People use devices differently which means we HAVE to build different user journeys. People need a better way to consume and experience mobile content, but many mobile experiences are still lagging far behind. Check out these 42 mobile landing page optimization tips to create better landing pages for your mobile visitors and continue reading this article to create better checkout flows for your mobile shoppers. To optimize your mobile checkout flow first identify your mobile visitor’s behavior. How much mobile traffic do you actually have? Start by identifying the amount of traffic you have on each device. How much percentage does mobile account for? Which pages to they visit? Another important element is identifying the most viewed pages. This will help in both identifying the path mobile visitors take and most importantly saving you money. Instead of optimizing the entire funnel and spending a lot of money, you can optimize specific pages within the funnel that require your attention. Where is the biggest drop in the funnel? Many times you’ll find that mobile visitors actually dropout much earlier in the process than the checkout. Once you’ve identified those tricky pages you’ll be able to optimize those before you reach the checkout funnel. How many visitors complete a purchase on mobile? The most important number – what percentage of mobile visitors actually complete a purchase? This number will help us define goals and monitor our success. 1. Pinch & Zoom – More than 73% of consumers won’t return to a website if it doesn’t load properly on their mobile devices. Pinch and zoom is obviously off the table. Make sure your visitors do not see this type of checkout. ** Pro tip: Creating a mobile site from scratch can be expensive, and a responsive design probably won’t increase conversions. Use Banana-Splash to trigger personalized messages for mobile visitors and convert them in one touch. In 2006 Amazon was already reporting a 1% loss in revenue per 100ms site load delay. Paste your website link in here and get some valuable tips on how to speed up your desktop and mobile site. 4. Registration – Probably the most debated question on desktop and mobile, requiring registration before a purchase, has it’s advantages and disadvantages. On one hand, by capturing your customer’s information you’ll be able to retarget them, create a better shopping experience and increase revenues in the long run (if you’re good at retention). On the other hand, registration creates a longer funnel that slows your customers down on the way to payment. Though you really want to register people before they checkout it could cause a large drop in your conversion rates. So, give users the opportunity to checkout without creating an account. 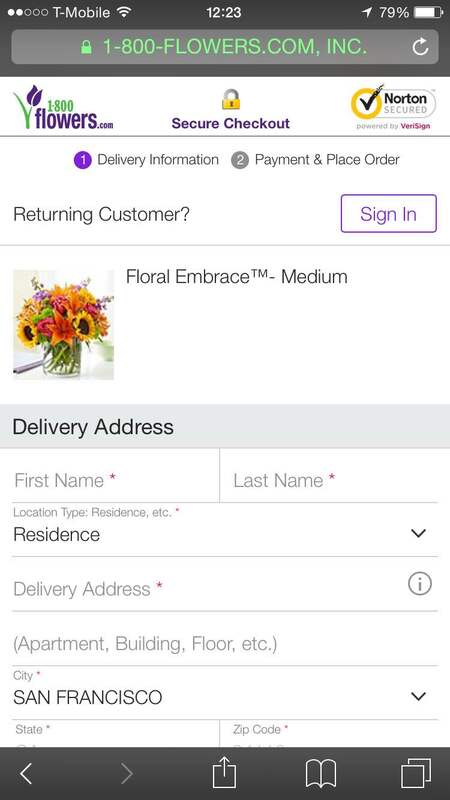 If you simply cannot go without, try registering people with their facebook or Google accounts (Etsy example below), allowing them to click on one button and swiftly continue with their purchase. 6. Trust – Unfortunately most shoppers do not feel safe shopping on mobile web yet which is why your checkout page should include some social proof. The most common social proof techniques use trust icons, testimonials or reviews. 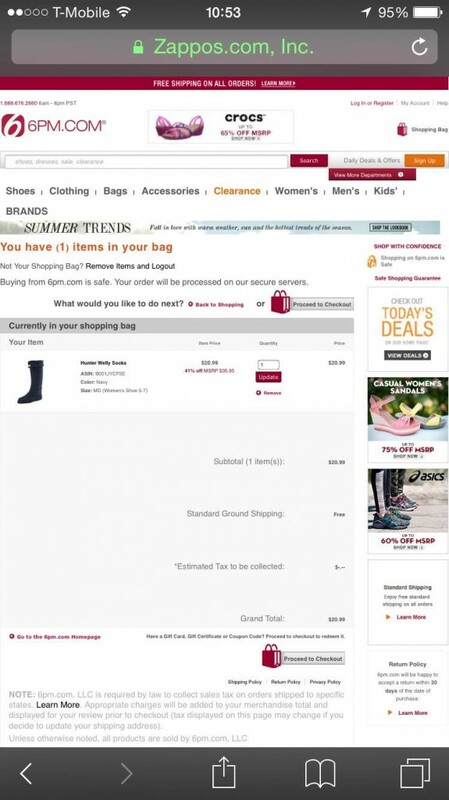 In the example below the company made use of trust icons to ensure shoppers they can safely checkout on this site. 7. Showing Progress – Similar to the web experience, people like to feel their progress and know their journey upfront. Most visitors do not have the patience to complete a long checkout process and need an indication within the funnel showing them how far they have to go. Zalando uses a progress bar to show the user there are 4 steps within the checkout funnel. 8. Remove distractions – Online shoppers have a low attention span and get distracted easily. To reduce distractions and keep our customers shopping you must reduce the amount of links, banners and any other data that isn’t relevant in the shopping experience. All links such as help, shipping information and sales should open in a new window, and all information should be easily displayed above the fold so shoppers do not need to scroll in order to complete an action. 9. 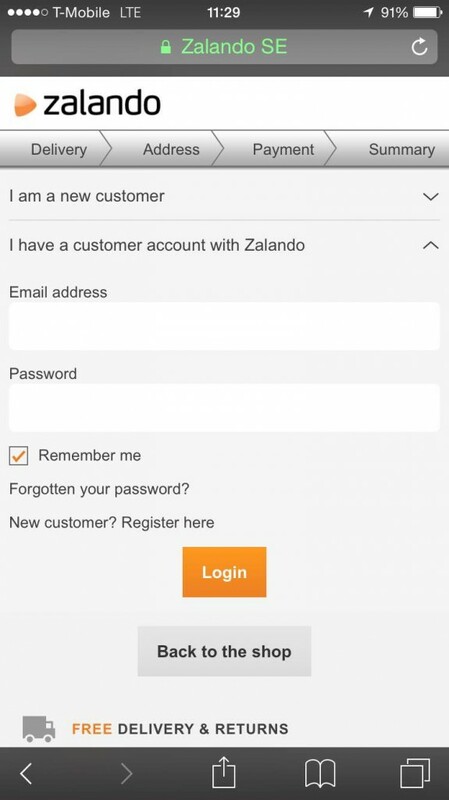 Checkout Access – Make sure people can enter their shopping bag and the checkout area easily from any page to complete their purchase quickly. While visitors browse items and add them to their cart, a good way to help them complete their purchase is by triggering a pop up that directs them to immediate checkout or ask them if they want to continue shopping. 10. Auto detect data – 62% of US online adults expect a mobile-friendly website and 23% expect their mobile experience to change based on location, according to Forrester’s US Mobile Mind Shift Online Survey. Prepopulate data into your forms and reduce the amount of action visitors must take to convert. Information such as the visitor’s state and city can be populated by simply getting visitors to fill in the zipcode field first. 11. Payment options – Giving customers the option to checkout in a few different ways will increase your conversion rates and social proof. By displaying logos such as checkout with Paypal or Amazon you increase trust as you are partnering with these well known brands and also allow your customers to checkout in their preferred way. 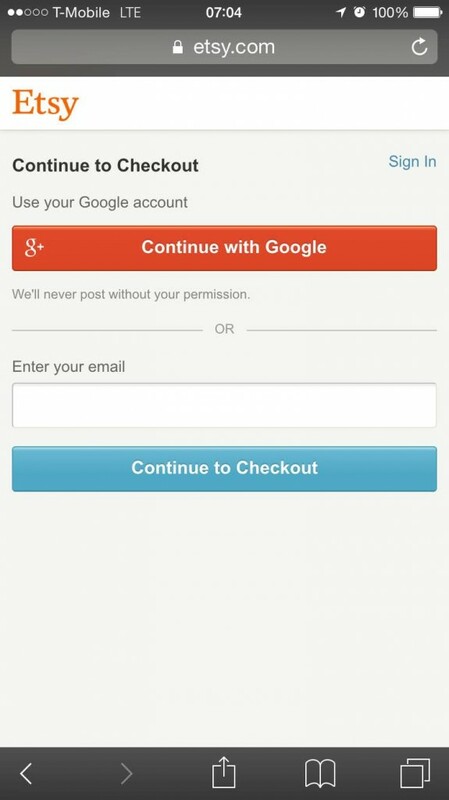 There are many quick and simple tips for mobile checkout optimization. The most important element of mobile optimization is to constantly measure and test your results. As mobile traffic and search continues to grow, it is imperative to have a conversion optimization strategy that will allow you to grow and expand your mobile revenues. The mobile conversion optimization guide.